Remember New Zealand Story? Of course, you do. It was only mentioned this week and has yet to shuffle off the main page into archive obscurity. Apparently, we aren't the only ones who remember. This article popped online only two days after the post about my frustration with the older version of the game did. 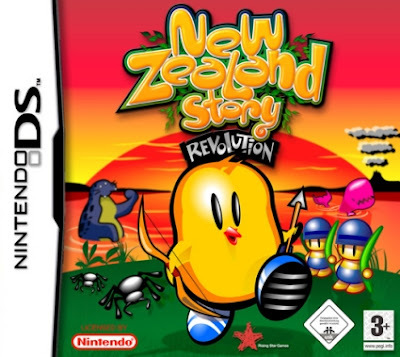 Very oddly, nearly everything I talked about is represented on the box art you see above: Mr. Kiwi, the weird boomerang-tossing Bobbies, the strange pink whale, and the villainous, kiwi-eating leopard seal. Strange when this blog makes its own foreshadowing.